With its first edition of Video Club, the Stedelijk Museum introduces a new screening series highlighting the museum’s renowned collection of time-based media. Through thematically organized selections of moving image works, Video Club will highlight films and videos spanning diverse eras, regions, and artistic movements. The rotating screening series puts moving image work into dialogue with other artworks on view in Stedelijk BASE, and draws attention to prominent issues and motifs that recur throughout the museum’s collection. Video Club’s inaugural iteration will include works from the 1960s and 70s that take landscape as a primary point of focus. A canonical art historical subject explored by countless painters, landscape has become equally important for video artists, who have reconsidered outdoor space through the lens of changing technological, social, and environmental contexts. 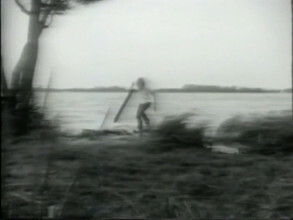 Created during a period in which artists were challenging the status of the autonomous art object through environmental interventions, the selected videos similarly redefine the relation between the human figure and the natural landscape by experimenting with notions of the politicized body as well as concepts of time, materiality, and scale. Artists featured in this inaugural series include Lawrence Weiner, Joan Jonas, Nan Hoover, Bill Viola, Gilbert and George, and Jan Dibbets. A newly acquired work by Martha Rosler, Flower Fields (1974), will also be shown for the first time at the Stedelijk Museum Amsterdam. Pizza and refreshments will be served. Following the approximately hour-long screening there will be a discussion with curator Karen Archey and Susan Gibb. Open discussion with the audience is encouraged.